Affordable school uniforms for a wide range of schools, for a donation. Darlington Town Mission - "We aim to prevent, and provide relief from, isolation in the elderly by visiting, providing social contact and Christian Fellowship." 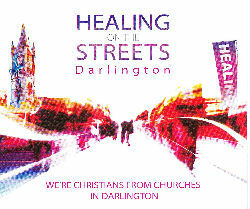 Healing on the Streets - Darlington - a ministry offered on alternate Saturday mornings to all who pass by. If you would like your group or organisation listed here please let the web master know. Note: click on any logo to return to the top of the page. These pages are pointers to various Christian organisations or groups serving the public in the Darlington area. There are many church organisations serving the needs of their own congregations but this listing is for groups offering a service to the general public and across the churches. The shop will be open ocasionally through the school term: see the Uniform Shop Facebook page: page for up-to-date details. Note that this is complementary to the service offered through our MP's office. The Darlington Area Churches Youth Ministry is run by Martin & Mel Stand as a service to young people and the churches in the Darlington Area. This innovative project was started when Martin & Mel moved into Darlington in the Autumn of 2007. See their page on this site or contact Martin & Mel on 01325 710203. The Mission was formed in 1838 by two Quakers and a 'churchman', to meet the needs of people suffering hardship - which in those days was mainly one of poverty. The needs of today are more in alleviating loneliness or giving practical help, especially when relatives who might have helped live out of town, sometimes many miles away. The Mission visits all who request us, regardless of religion, race, age or gender. Our services are free. For full information visit their website at http://darlingtontownmission.org.uk/ or telephone 07943251357. Kings Church in Whessoe Road run a furniture re-use scheme. The church collects used furniture and distributes it to those in need. Anyone who lives in the borough of Darlington not just the town itself and is on income based benefits is quite welcome to come along and choose whatever items of furniture they would like. They will then deliver these items to you if you require or you can collect them yourself straight away (opening times only). They also accept referrals from third party agencies i.e.. Social Services, EMMA project, Sure Start etc. So what's the chaplaincy for? To provide pastoral and spiritual support for the hospital community. Who are the chaplains at the Darlington Hospitals? Rev. Tom Gibbons, Rev. Catherine Minor and Deacon Jürgen Muller work in Darlington Memorial Hospital. Colin Jay and Jürgen Muller work in West Park Hospital for the Mental Health Trust. Colin & Jürgen also work in Auckland Park which is a hospital for older people with mental health problems and also takes patients from Darlington. They visit the wards and take services, They give pastoral support and counsel to individuals and groups at the bedside and at the chaplaincy centre. Can anyone in hospital use the chaplaincy? Yes, patients, relatives, staff, volunteers – chaplains are there for everyone. Do you have to be religious to talk to a chaplain? No, chaplains are happy to discuss the issues that are important for each individual person. Every conversation is totally confidential? Chaplains offer personal support to people of all faiths and can, on the patients behalf and with the patients permission, contact their own faith leader. How does the chaplaincy work with the churches? The chaplaincy receives referrals from the churches – from individuals and their clergy and pastors. We in turn are happy to refer people to local churches (with their permission of course). Who administers the sacraments, Holy Communion & Baptism, in hospital? Normally the chaplains. All the sacraments of the church are administered in hospital at one time or another, at the bedside or in the chapel. Holy Mass is celebrated in chapel on Thursdays at 10.30am, Holy Communion on Sundays at 11am. Are church members directly involved in hospital visiting? Yes. We have a small ecumenical / multi-faith team of visitors. How might I be able to help the chaplaincy? * By considering joining the team of ward visitors. * By coming to help take patients along to the Sunday Service. * By joining the chapel flower-arranging rota. For Darlington Memorial chaplaincy phone 01325 743029. The contact number for the chaplaincy at West Park Hospital is 01325 552045. No information is gathered from anyone being ministered too, and there is no formal follow up to those who ask for prayer. HOTS meets fortnightly on a Saturday from 11am to 1pm alternating between Northgate and the performance area beside the Joseph Pease statue. Prayer is offered by trained and accredited helpers who have the approval of their own church ministers. So if you would like prayer, come along and "take a seat". The dates for HOTS are listed on our "Whats On" page. For more information telephone 07813 271722. Open Gate is a community chaplaincy project which works with women who are released from Low Newton prison in Brasside, Durham, returning to the North East region. We support them as they resettle in the community through practical help and 1:1 mentoring support. The project aims to aid resettlement and help reduce the risks of re-offending, so building safer communities for all.